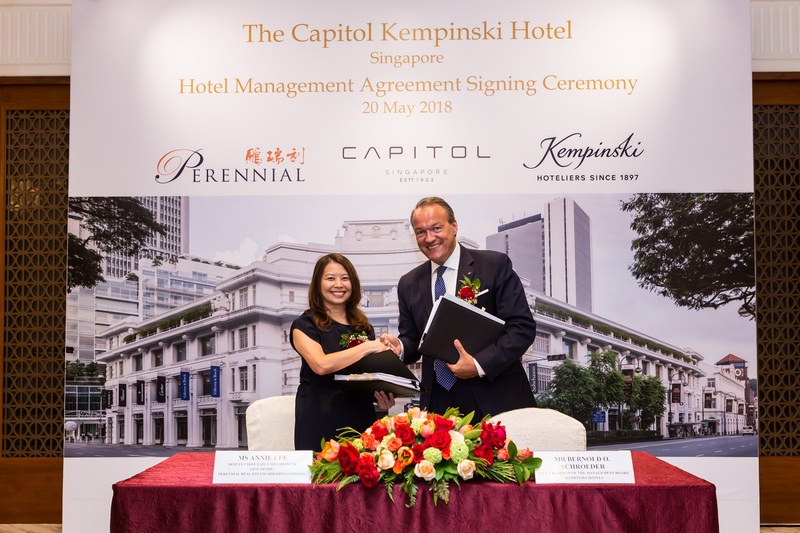 Kempinski Hotels has announced plans to open The Capitol Kempinski Hotel Singapore at Capitol Singapore, the first luxury heritage lifestyle destination in the city-state’s downtown Civic District. The property is owned and managed by Singapore-based, Perennial Real Estate Holdings. Comprising three heritage buildings, Capitol Singapore houses the premier shopping and dining destination Capitol Piazza, the iconic Capitol Theatre, the luxurious Eden Residences Capitol and the upcoming The Capitol Kempinski Hotel Singapore. Rich with history and alive with memories, these carefully restored iconic buildings offer the perfect stage for a cultural renaissance in modern-day Singapore. The hotel itself is an art deco jewel, housed in the restored Capitol Building and Stamford House, with 157 guest rooms and suites. It will also feature a leading international restaurant under the helm of a Michelin-starred chef. The holistic Kempinski experience will extend beyond the hotel to the Galleria, an air-conditioned sheltered promenade which is part of Capitol Piazza, where an array of quintessentially Kempinski gastronomic delights will enchant tourists and locals, with an exquisite selection of culinary treasures. While hotel guests will be able to appreciate a plethora of arts and cultural performances and events at the Capitol Theatre, residents at Eden Residences Capitol will also be able to enjoy the bespoke concierge and personalised services to be provided by The Capitol Kempinski Hotel Singapore. The full range of services at The Capitol Kempinski Hotel Singapore will be made available over the course of several phases towards the end of 2018, starting with the hotel opening in September. Bernold Schroeder, vice chairman of the management board of Kempinski Hotels said: “Singapore is one of the world’s most exciting destinations and a crossroads of the past and future, making it an ideal stage for our continued expansion in Asia. The addition of The Capitol Kempinski Hotel Singapore to the Kempinski portfolio is part of the company’s continued expansion into Asia, alongside upcoming The Apurva Kempinski Bali.